Now 12, Sebastien is on the brink of leaving childhood behind. 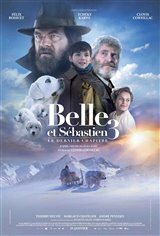 His newly married father Pierre is trading the mountain life for a new start with his family in Canada, but Sebastien is reluctant to leave. During Pierre’s honeymoon, a stranger, who claims to be Belle’s former owner, comes to claim her. Sebastien will do everything possible to keep his beloved dog and her new puppies from the claws of this sinister individual.